At Halloween time, spells are cast. I am sure that witches will be out this Sunday, eyes on suitable partners in their Halloween finery. A love spell might be just the thing to attract a man who could successfully fill out a pointy hat. I began with Color Club Resort to Red. With Konad white pearl special polish, I stamped the spider web from image plate T13. I let the web catch pink and red hearts from Art Club Sprinkles. On each nail, there are four hearts: two large and two small. Even witches have laundry day. These witch hats are hanging in Mt. Holly, NJ. Resort to Red has pink and violet in the base. This romantic shade has a pearl finish. There are visible brushstrokes when painting, but their appearance lessens after topcoat has been applied. I really love this color! It has more visual interest than a standard red, but still looks classic. I hope you enjoy the Halloween love spell I cast. Color Club Resort to Red was provided for review. This shade and others from the Untamed Luxury Collection are available for purchase at victoriasnailsupply.com. The hearts from Art Club Sprinkles were also sent for review purposes. Image plate T13 was provided for my consideration. To view to the full line of nail art stamping plates, please stop by chez-delaney.com. On November 15, Nubar will be releasing Holiday Jewel Basket. It looks like they put together a gorgeous mix of sparkle for the Holidays. I am really excited to try Pixie Dust. I'm thrilled they are adding in Nubar 2010 to this Collection. My bottle from this summer received so much use. I definitely need a backup. Nubar makes some of my favorite glitter polishes. The pricing of this set is notable as well: $49.95 for seven polishes plus Foundation base coat and Diamont top coat. Let me know what you ladies are excited about seeing! Give the gift of beautiful nails! 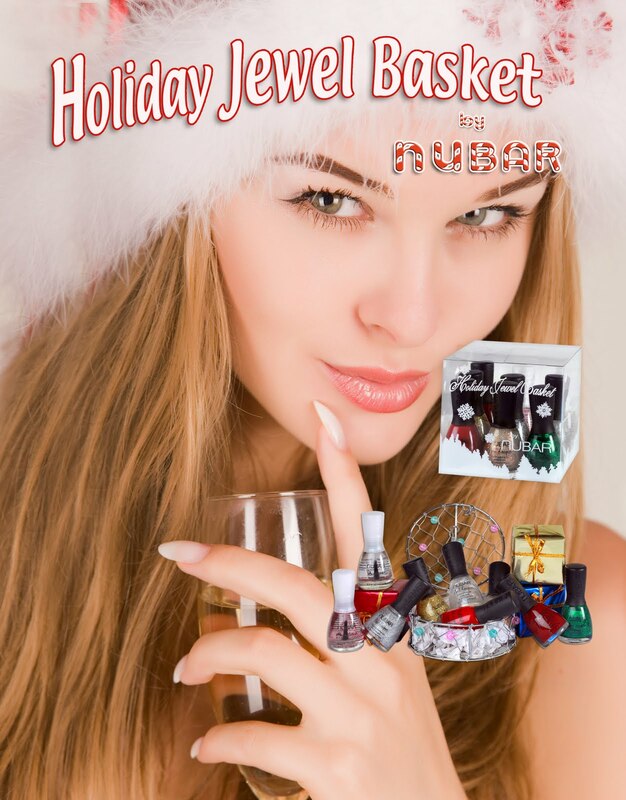 nubar's Holiday Jewel Basket is filled with nine nubar classics for a perfect holiday manicure. With a range from glitters to classic red crème, the Holiday Jewel Basket has something for every woman. Always free of formaldehyde, phthalate and toluene, the nail lacquers in Holiday Jewel Basket offer four fine glitters, two glitter top coats, a classic red crème, Foundation Base Coat, and Diamont Top Coat. Grass Green Glitter: a fine green glitter. Silver Glitter: a fine silver glitter. Gold Glitter: a fine gold glitter. Pixie Dust: a delicate dusting of shimmer. Ruby Red Glitz: a fine red glitter. Nubar 2010: a flaky glitter in a color changing base. Competition Red: a classic red creme. My sister and I worked at the Moonlight Masquerade this weekend. Inside the historic and haunted Mt. Holly Library, there was a costume party, a spooky feast and perhaps wandering spirits and goblins afoot. Allow me to offer you a tour. In the foyer, you will be greeted by The Raven. A mantle of expressive pumpkins. The Magician Tarot card, a crystal ball and The Fine Art Tarot. On the second floor, a spell is cast. A grimoire, a candle and a corked bottle of shrunken pumpkins. Leave no black plume as a token of that lie thy soul hath spoken. An owl guards the attic. Someone has been here for quite awhile. My sister and I used the Ouija board in the attic. We survived to tell the tale. The flash offered more illumination for our virtual tour. In the haunted library, we existed by candle flame and a few glowing strands of light. Happy painting, ladies, and happy haunting!